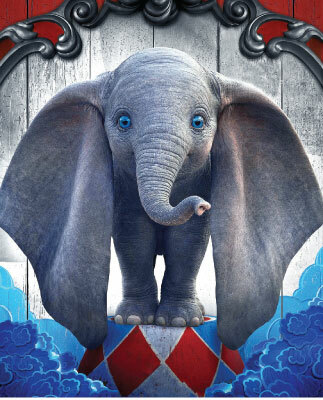 Home 'Dumbo' character posters unveiled! Before ‘Dumbo’ flies back to the big screen on March 29, here is an exclusive first look at the new character posters for Disney’s new live-action reimagining of its beloved 1941 animated tale, directed by Tim Burton. ‘Dumbo’ tells the story of a baby elephant born with abnormally large ears, who is separated from his mother and shunned by other elephants. When Dumbo is introduced to the circus audience and his large ears break free of the ties holding them back, the crowd boos him - but the baby elephant has a surprising trick up his sleeve. He can fly. Revived for the big screen 78 years later and starring Colin Farrell, Michael Keaton, and Eva Green, the story of ‘Dumb’o lends itself to a timely conversation about being considerate. “People are worn out, not just by cruelty, but judgment and discrimination and inequality,” Keaton told EW. The story of an oddly distinctive but beloved elephant serves as a reminder of the importance of “inclusion, acceptance, kindness, and support,” Farrell added.